Home Gratitude What’s Wrong With The World? Something emotionally interesting happened to me yesterday, so much so that it inspired me to write these sentiments. I was driving mid morning and noticed the flashing lights of an ambulance in the distance. Without a thought, I immediately pulled over to the side of the road. As I sat waiting for the ambulance to pass by safely, that which t I observed next brought me to tears. What I found incredibly interesting about my emotional response to what I witnessed, stayed with me for the rest of the day. Sitting in my car road side, I watched as rhythmically one by one the rest of the traffic on the road pulled over and stood still as well. Both directions of traffic did the same, then the drivers of each and every car, including me sat waiting respectfully and patiently for the ambulance to speed pass without hesitation. All the way home I had a lump in my throat and a kleenex to wipe the tears out of my eyes. I was deeply touched by what had come to my attention and it made me think about it, a lot. Grant it, there have been many a time when pulling over to the side of the road for an ambulance on occasion, had been a bit of an inconvenience, but this particular morning, something else had happened to me. What fascinated me about the mornings event brought a sense of the words ‘poetic cooperation’ to my mind. It was indeed so poetic to watch each car on the road pull over as the ambulance got nearer to them. What’s wrong with the world? I quietly asked myself while I was driving home, wiping my tears, and trying to swallow the big lump out of my throat. In the animal kingdom the survival of the fittest is how a species continues to exist. But what else does the animal world practice that allows them to continue to live through all of the hardships and dangers that they face each day, what do animals do that allows them to sustain themselves to pull though, get through and hold onto their survival? I realized it was cooperation. Exactly what I had witnessed moments earlier, I had been emotionally touched by the way my fellow humans in their cars had cooperated for the ambulance. We were working together, without a thought to help another human that was in dire need, and perhaps fighting for his life. Isn’t that what the untamed world of animals do, work together for the good of the whole! They flock, herd, crowd, horde and congregate together to help and provide each other with the basic needs for survival; food, shelter and water. Cooperation, teamwork, partnership and collaboration, if only we humans could do it as well as the animal kingdom do! 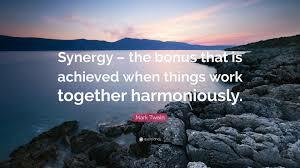 What’s wrong with the world, I ask, I believe we need more synergy is my answer. More of the kind of combined effort that made me cry while I was sitting on the side of the road, watching as one by one the cars stood still, just like me, quietly and patiently to help another. I am curious, have any of you been emotionally effected watching what happens when human beings work together to help protect each other, without a thought, or a care or concern, just pure cooperation to help a fellow being? (write to me). What the world needs now more than ever, is loving cooperation, not to line the pocket book, or for any other reason but to be kind and to offer synergy that comes from the heart and soul of who we are.